Situated in the heart of downtown Phoenix, the Hotel San Carlos is a quaint boutique hotel, or should we say, a real boo-tique hotel! Having been a guest there a few times, I sadly did not have the pleasure of a ghostly encounter, however, this hotel is reported to be an actively haunted place. 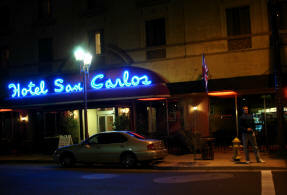 Historically, the Hotel San Carlos was built on the site of Phoenix's first elementary school. A well was dug for the school in 1874, tapping into a spring that had been considered sacred by the Native Americans for centuries. This well still operates in the hotel basement today. 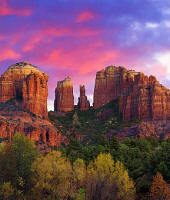 Native Americans used the ground and underlying water sources as a site for worshipping the God of Learning. Consequently, guests visiting the San Carlos claim to feel the spiritual aura of the historic water flow. Perhaps this is attracting the ghosts. So who are these ghosts? Three noisy young boys have been heard running through the halls of the San Carlos. Unexplained sounds of children laughing and playing. Perhaps the ghostly presence from the original elementary school. The spirit of Leone Jensen, who committed suicide at the San Carlos on May 7, 1928 by jumping off the roof of the seven-story building. She was heartbroken about a bellboy from a nearby hotel. You'll know you have seen her if you see a white, cloudy figure accompanied by an eerie moaning noise. Addendum: I just returned from a visit at the San Carlos in February 2008, and was more specifically informed that the female ghost - the one who jumped from the seventh floor jumped from Room 720. Unfortunately, someone was occupying Room 720 at the time so I could not get any pictures from inside the room, or pick up any vibe within the room. Also, I did not get any vibe outside the room. However, I did get some pictures of the door and hallway. I did stay in Room 616 but experienced no paranormal energy. However... the room I was first booked in, Room 625 had such a bad, dark and heavy energy, my fiancé requested a new room. Room 616 felt "ok."
Located in the historic ghost town of Jerome, you must visit the Jerome Grand Hotel if you want to experience a ghostly encounter. Before it became the Jerome Grand Hotel, it was once a hospital and asylum called the United Verde Hospital. The UVH was built in January 1927 and closed its doors in 1950. 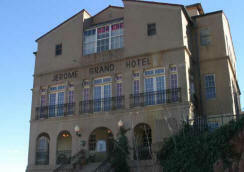 However, in 1994, it was bought and restored to what it's known today - The Jerome Grand Hotel. It is said to be one of the most haunted buildings in Arizona, perhaps due to its days as a hospital and asylum. Sounds of coughing and moaning from patients once treated at the former hospital. A woman in white roaming the halls. Doors opening and closing on their own. The colorful Hotel Congress is an old western boutique hotel located in the sleepy downtown section of Tucson. 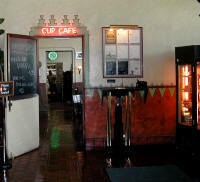 It’s famous for its coffee shop, the Cup Cafe and its club, the Tap Room, which attracts many musicians. This amazing hotel is even pet-friendly! Love it! Hotel Congress just has that edgy, hip feel to it. However, what isn’t so obvious to its guests is its paranormal edge. Yes, the Hotel Congress is haunted. I was there in the blazing summer heat in August 2002. At the time, I wasn’t even aware it was haunted! Sure, it had an old lived-in feeling, so I am not surprised that it’s reportedly haunted by spirits. Unfortunately, I didn’t experience any spirits. Once again, the ghosts dodged me! Yet, their collection of local art work didn’t, and I plunked down some good cash for some art. 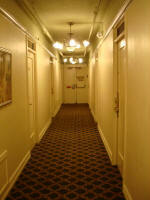 There have been sightings of a female ghost clothed in Victorian dress that floats about the stairwell and lobby (left). She is said to smell of roses. A male spirit named T.S. wears an old-fashioned suit who can be seen peering out the 2nd floor windows. They say he may have been a victim of a gunfight over a card game. Room 242 is reportedly haunted by a woman who shot herself in the bathroom after a police standoff. She has been seen by the bathroom and just outside the room. Guests have reported noises and nightmares while staying in this room. There is even a “new and shiny” spirit, the hotel’s beloved Vince, who was a permanent resident for 36 years until his died in 2001. Hotel staff members have since been finding butter knives from the Cup Cafe (right), like the one he used for a screwdriver, in various locations around the 2nd floor.